Arthur Geeson sittng on a wooden crate in front of the family grocer's shop in Church Street, Bottesford, in 1903. Bottesford Heritage Archive: from the collection of Mrs Mary Owen. Geeson's grocery shop, Church Street - a general view in which Arthur Geeson is seen sitting on a crate in front of the shop in 1903. 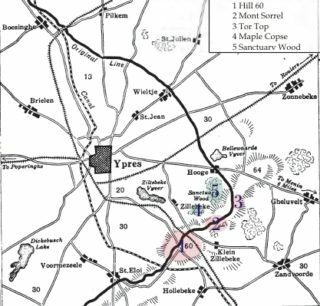 A general map showing the location of Hill 60 in relation to Ypres, the front line and other key locations. Arthur Geeson is one of the men named on the Bottesford ‘church list’ of WW1 Servicemen. Arthur Cecil Geeson was born on August 6th, 1897 at Isleworth, Middlesex. His parents were Francis Wood Geeson, a Londoner born in October 1856, and Ellen Geeson, nee Simpson, who was born in 1861 at Brighton. Francis and Ellen married on November 20th 1888. Unfortunately, Ellen died ten years later, in 1898, shortly after the birth of Arthur, when she was 37 years old. After his wife’s death, Arthur’s farther Francis stayed in London. In 1901 he was living on London Road, Twickenham, and employed as a grocer, possibly by his brother. He married his second wife, Ada Watson, in July 1902, but but he too died prematurely, in July 1910, at the age of 53, at Southwell Nottinghamshire. Infant Arthur and sister Evelyn had been taken to live with their family in Bottesford. In 1901, he was recorded in the census as a boarder, staying with his Geeson relations in Church Street, where, at 3 Church Street, lived 72 year old grocer Elizabeth Geeson assisted by her daughters Mary J. Geeson (aged 40) and Annie Geeson (aged 38), together with the two ‘boarders’, 7 year old Edith M Geeson and 3 year old Arthur Geeson, sister and brother, both from Isleworth. By 1911, the year after his father died, Arthur had left Bottesford and gone to live with his 39 year old step-mother, Ada Geeson, at The Nook, Lowdham, Nottinghamshire, together with his sister Evelyn Marie Geeson, aged 17, and his step-sister Kathleen Marie Geeson, aged 5 (who sadly died the next year). Evelyn had been recorded as Edith in the 1901 census, but her birth record confirms that her name was Evelyn Marie Geeson, born at Brentford, Middlesex in 1894. She died in 1958 at Southwell, Notts, aged 64. Arthur Geeson enlisted underage, just 17 years 2 months, at Loughborough, on the 14th October, 1915. He served as a Private in the 2/5th Leicestershire Regiment, Service Number 2842, undergoing training in Melton Mowbray, Loughborough, Epping and Luton. He sailed from Southampton on June 28th, 1915, and arrived in Rouen on June 30th, 1915. Less than three months later, on September 1st, 1915, he was severely wounded with gunshot wounds to the chest. This happened during the intense fighting at Hill 60, near Ypres, and he was first treated in a hospital in Etaples. He was moved to the Bethnal Green Military hospital on October 26th 1915 and was eventually released from hospital in March, 1916. The shrapnel was never completely removed from his chest. He was awarded the 1915-Star, the Victory Medal, the British War Medal and, because of his wounds, was discharged on July 13th, 1916, and given a Silver Badge, No.8190. Hill 60 was the scene of much fighting in 1915, much of it hand to hand. The Hill itself was devastated by shell fire and mine explosions. It lies on the Front Line south of the city of Ypres, and was the site of an intense battle in April and May, 1915. However, Arthur Geeson was wounded during the months that followed, a period of relative quiet but in which fighting was still taking place. After the war, Arthur Geeson worked on the farms of Daniel Richmond Daybell and Hedley Miller in Bottesford. Hedley Miller had lost two sons, William Hedley and Horace, to the influenza epidemic within days of the return of one, William Hedley Miller, following his discharge from the army in February 1919. Arthur was not a victim of the disease, happily. On June 6th, 1933, he married Mary Richmond Daybell, born in 1908 at Barton-on-Irwell, Lancashire, the elder daughter of Daniel (Junior) and Elizabeth Sarah Daybell (nee Lovett). He went on to become a tenant farmer at North Muskham, where they stayed until 1937, before moving to Coddington and farming there until 1958 on land that became part of the present Newark Showground. In the 1939 Register, the address is given as Hall Farm, Main Street, Newark Rural District (Coddington). He stayed in Coddington after his retirement, and died on November 19th 1982, aged 85 years.